Refer to the SmartEvidence administration for more details on how to set up SmartEvidence frameworks. When an institution allows SmartEvidence, any user in that institution can work with the frameworks that are available. The framework is selected on the collection’s Edit screen for institution or personal collections. Refer to the section “Write an annotation” for more information on how to add an annotation and associate it with a standard. You can add as many annotations to a page for different standards as you wish. When you place an annotation onto the SmartEvidence map, it is automatically added to your page. There are two ways of giving feedback on an annotation. Anyone who can comment on the collection can provide feedback to the portfolio author on an annotation. 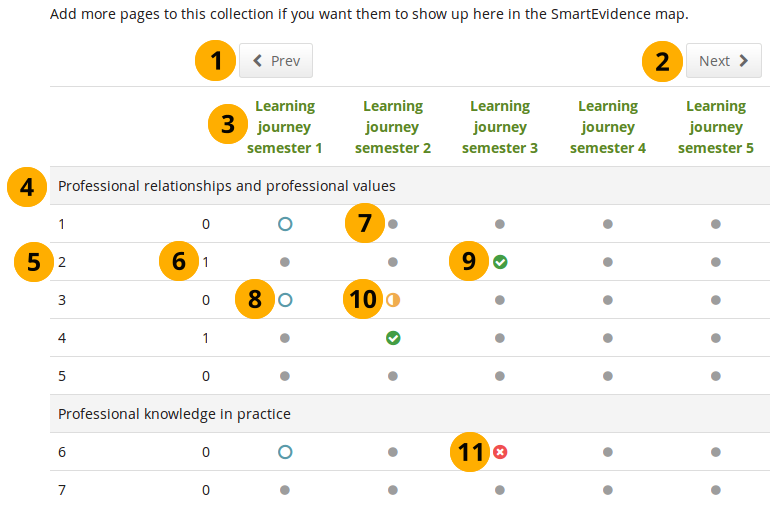 Staff members or institution administrators can assess the evidence linked to the annotation unless the SmartEvidence framework is a self-assessment one when only the portfolio authors can assess themselves. The staff or institution administrators need to be in the same institution as the portfolio author in order to assess the portfolio. Refer to the section “Respond to an annotation” for more details. The SmartEvidence map, which is displayed as the first page in a collection that is associated with a framework, is modelled after an evidence map. It visualizes which areas of the framework have already been completed and where there is still more work to be done. Click the Previous button to go to a page in the collection that comes before the first one shown if there are many pages in the collection. Click the Next button to go to a page in the collection that comes after the last one shown if there are many pages in the collection. The titles of the pages are displayed. Heading for the standard group. The shortname of a standard or sub-standard is displayed. A count of how many pages have been set to fulfill the criteria for a particular standard. A dot means that the page has not been associated with the selected standard. Everybody but the portfolio author sees a grey line. The circle indicates that this page is ready for assessment for the selected standard. The checkmark is displayed when the assessor agreed that the page fulfills the criteria for this particular standard. The half moon shows that this page still needs some work before it can be marked as fulfilling the standard. The cross means that the evidence displayed on the page is not sufficient to demonstrate this particular standard. You can copy a SmartEvidence collection. When doing so, the annotations are retained, but the feedback on the annotations is not. 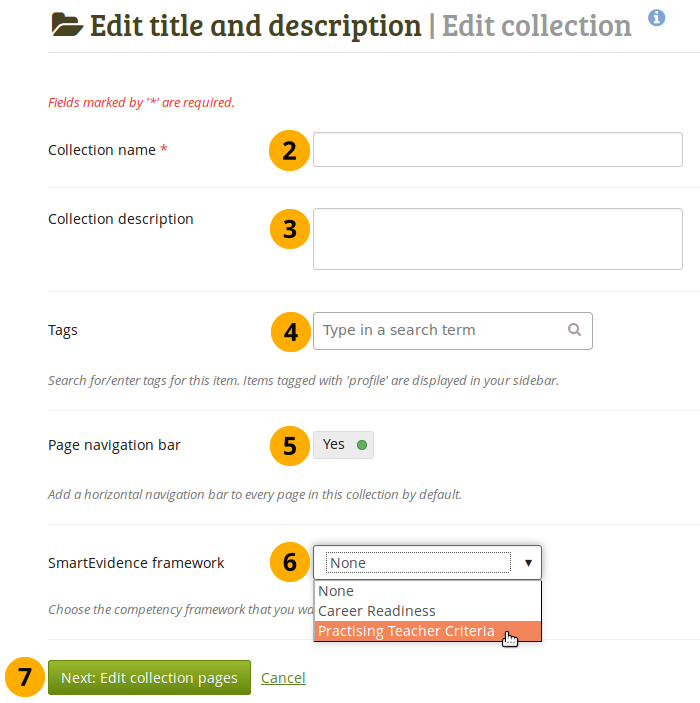 You can then make changes to the collection and update the annotations before submitting the new collection for assessment.